WiiWareWave Kicks The Holidays Off With A Bang! Holiday Wishes Contests And Reviews Inbound! Wii Give U Our Thanks! It's that time of the year again so we want to do something special for all of you today! First off I will be posting my review of The Mysterious Cities of Gold later today! Clannad will also be posting her review of Wii Sports Club: Tennis tonight and we will also be giving away a free North American download code for TNT Racers: Nitro Machines edition for the Wii U eshop on Twitter today! We hope you have a wonderful Thanksgiving and hope you enjoy your special meal and spending time with your family! Re: WiiWareWave Kicks The Holidays Off With A Bang! Holiday Wishes Contests And Reviews Inbound! 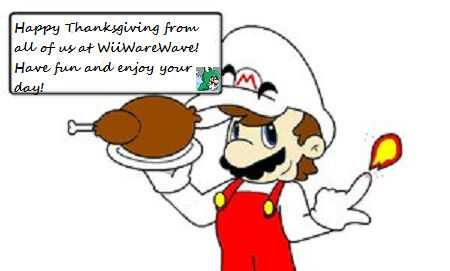 Happy Thanksgiving celebrations WiiWareWave members! To all my American friends on WiiWareWave, Happy Thanksgiving! And to all the Junihoshian members on WiiWareWave, Happy Dragon Festival! I hope you had a fantastic Thanksgiving everyone! Thanksgiving was awesome this year!